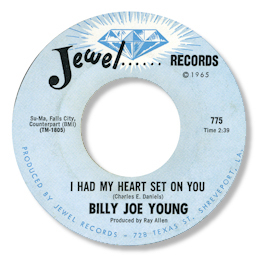 For quite a few years now I've wondered who Billy Joe Young might be – although it was clear he was not the Georgia artist Billy “Country Boy” Young. Billy Joe's issued songs were credited to that interesting country artist Charlie Daniels and it was not beyond the bounds of possibility that the vocalist could have been Daniels himself. The confusion in my mind was only exacerbated by the fact that Daniels recorded a song called “Billy Joe Young” in the 70s. Recently I had the opportunity of getting an answer to the question from Charlie himself who agreed he wrote and produced the songs for Stan Lewis but was not himself singing on the tracks. On the same message board a guy said that Young was really Billy Joe Ash who led a band called Billy & The Confidentials, active in Baltimore in the early 60s. 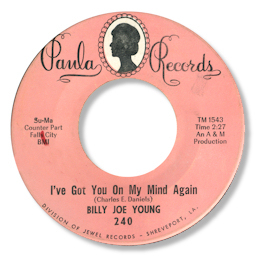 He says that Ash himself gave him copies of their early discs which included a slowed down version of “Got You On My Mind Again” cut for BJ in 1962/3. As further evidence that Ash was the guy he says that Daniels and Ronnie Dove operated a studio in Bank Street, Baltimore at the time where all the tracks that appeared on Jewel / Paula must have been cut. Well that seems a bit strange as the producer of Jewel 775 is credited as Ray Allen, who was a Cincinnati producer rather than Baltimore. But I’ve no reason to doubt the main points of the theory – especially as “Billy Joe Young” has always sounded to me as though he might have been white – but the real truth of course lies in the quality of the tracks. And for Billy Joe that commodity is very high indeed. The excellent I Had My Heart Set On You is the pick of the ballads without a doubt, although dance fans will point to cuts like “Little Tin Soldier” or “The Push” as being preferable. But for some reason the best track remained in the can. Give This Fool Another Chance was brought into the light on a Japanese album in the 80s – but what a corker it is! Really fine gritty testifying over a fully committed band. Eddie Whitehead issued a version of it, also produced by Ray Allen, but Young’s powerhouse interpretation just might pip it at the post. Thanks to “Boogs” for the Billy Joe Ash info, and to my friend Joe Sperry for inspiration. Note ~ You can find "Give this fool another chance" and "I had my heart set on you" on the UK Westside CD "Soul Jewels Vol 1".